The New York Times is talking about how hipsters are taking over San Francisco, and how the art scene here is dead. I just smile and nod, since people have been saying a version of this for decades. San Francisco was born in revolution and chaos: taken from the Ohlone by the Spanish, liberated into Mexico, planned and built by a Spanish-English coalition, ceded by Mexico to the United States. It’s been shaken by earthquakes, and economic and political upheaval, every twenty or so years. Yes, it’s expensive to live here. It felt expensive when I first moved here in 1979, and lived in a roach-infested one bedroom flat on Post between Polk and Larkin for $400 a month. We lasted just a few months before we fled for a cheaper city. And yes, an awful lot of tech employees have moved into the Mission and there’s been a kerfuffle of protest. Meanwhile, 4,000 additional people moved into my neighborhood just last year. We didn’t make the news, because OMI isn’t hip, hell, it’s just newly reclaimed from serious drug violence. Its petite charms are yet to be discovered by the press and the hipsters. Quiet, child-rearing techsters are moving into the OMI as those originally forced to move here in the 1960s are selling off their inherited properties before the next housing bust. It’s a quiet, orderly changing of the guard, and I hope it happens just as slowly as it possibly can. My neighbors on either side are sweet, wise women who help keep their kids’ lives together in the face of still-rampant racism and underemployment. Nobody hates us over here in OMI, not yet anyway. It’s not a badge of honor to be one step above drug-trade violence, but I’ll take what I can get. You can see where the hipster stereotype is coming from. At a recent visit to a Mission coffee shop, I saw a lot of people in porkpie hats, completely absorbed in their digital devices, ignoring the world around them. So I think the hipsters, who are spending upwards of 70% of their income on rent, have a little more work to do if they want to belong instead of be reviled. I know it’s possible, because I see it in my OMI neighborhood every day. San Francisco, the first beautiful thing I found after my mother’s death, has artists and writers who live and work here without angels, municipal, corporate, or private--it's not any more artistically dead here than when the Summer of Love morphed into the Winter of Dirty Sidewalks. Whether it's Noir City, LitQuake, Outside Lands, or smaller salons and gatherings, we’re here, and we’re creating every day—directly, or indirectly by supporting city-wise initiatives like San Francisco Beautiful or 826 Valencia. Perhaps we could be less iconoclastic, and instead grow better skills of cooperation with each other but we’re not dead. Far from it, my friends. And, like the rollickingly open port city we've always been, we welcome you, whether or not you live within our 47 square miles. What’s your favorite SF arts organization? It's been interesting to realize that in this world where social media is ubiquitous, we connect more *in person* than online. You'll still find us online individually (e.g. 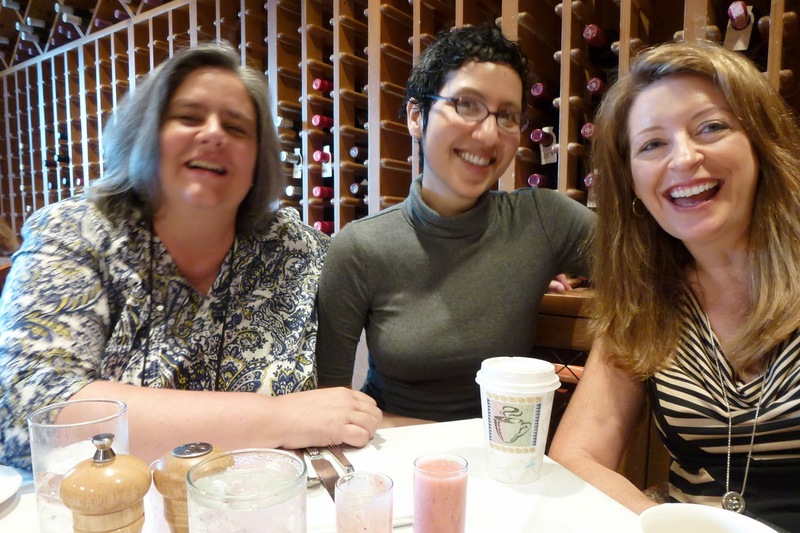 Juliet loves Facebook, Gigi loves Twitter, Rachael loves her blog, Mysti is part of another group blog), but when we get together as a group, more often than not it's at a cafe or a bookstore instead of here on the blog. 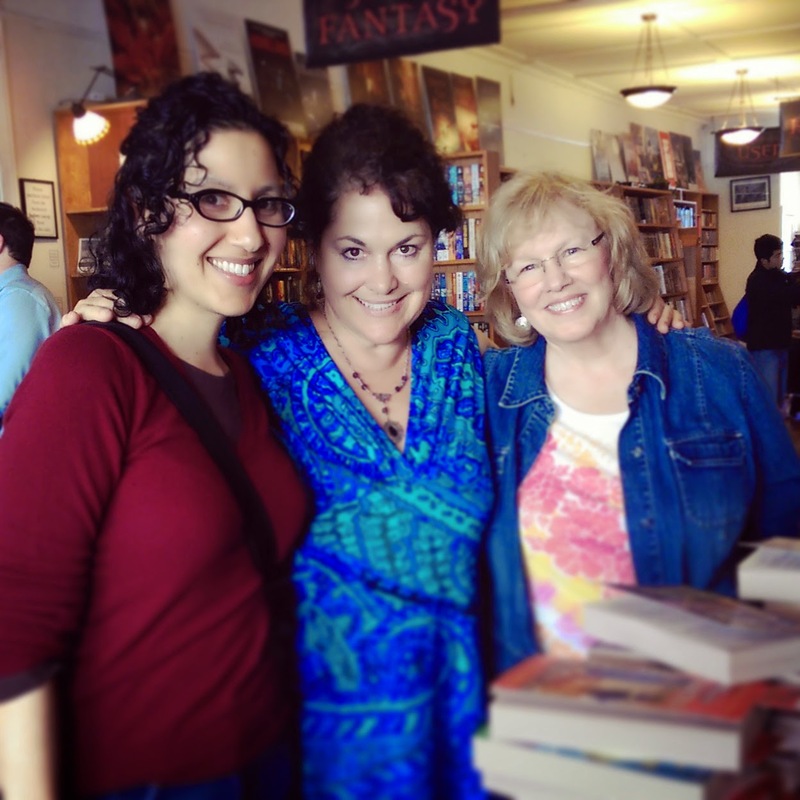 Case in point: this past month, several of us did bookstore events together. 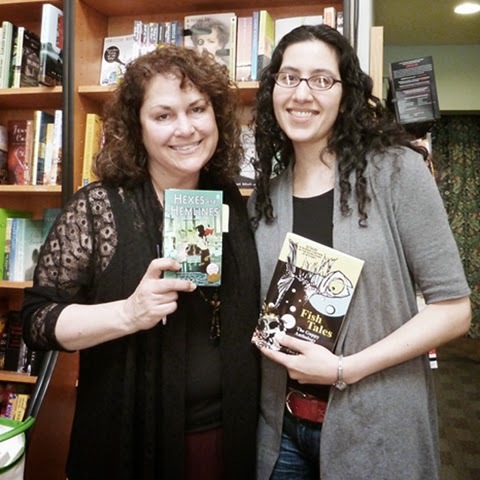 Here are a few photos from our events at Borderlands Books in San Francisco and Village House of Books in Los Gatos. 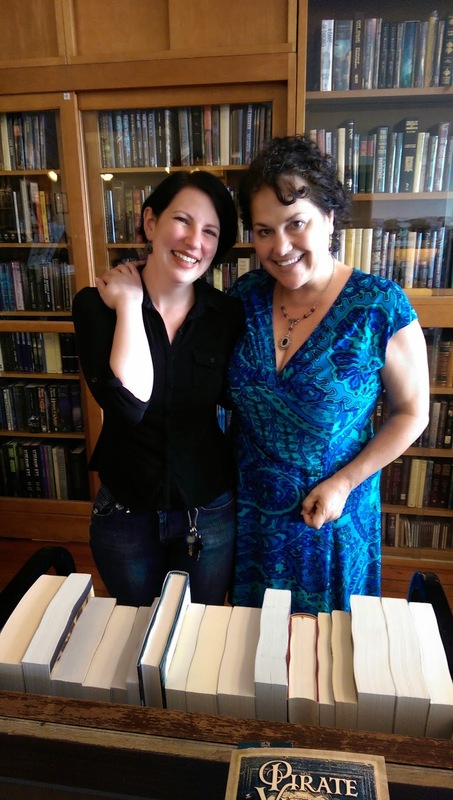 Borderlands Books manager Jude Feldman with Juliet Blackwell. 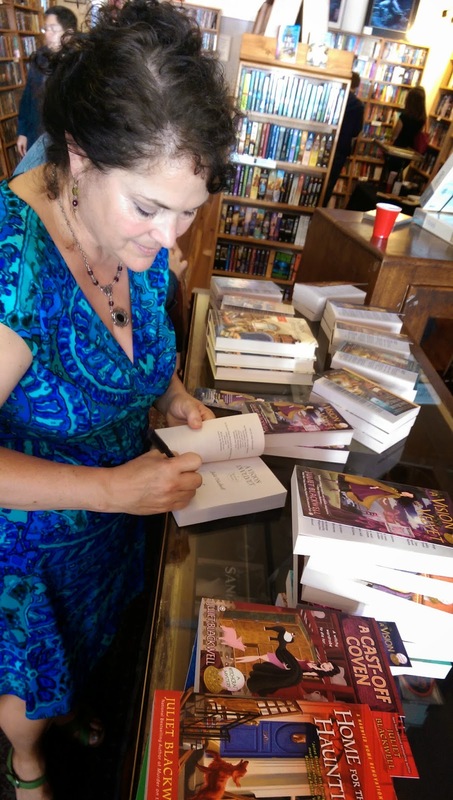 Juliet Blackwell signing books at Borderlands in San Francisco. 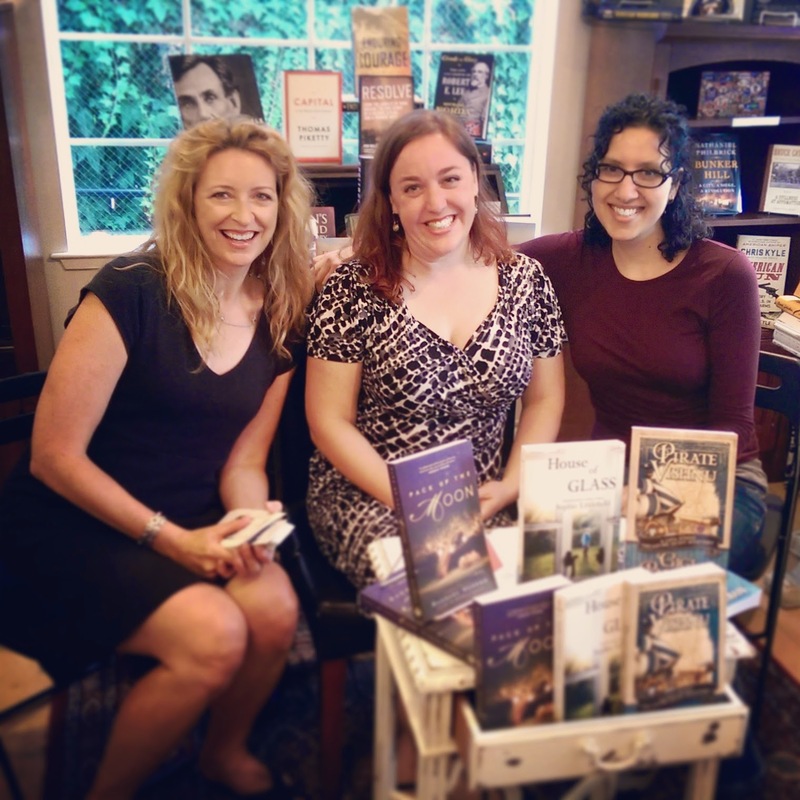 Gigi Pandian, Juliet Blackwell, and Kate Carlisle at Borderlands Books. at Village House of Books in Los Gatos. ME: That Laura Lippman is something else! She doesn't just count how many women vs. men authors get awards, she counts the gender of the protagonists! HE: Huh. I wonder what would happen if you counted the victims. I bet the pages are littered with women. But the thing is--I didn't do it on purpose! And to make it worse, I mostly only killed off nice guys. (I'm sorry. Sorry, sorry, sorry!!!!!). So I've managed to commit the same sin, in reverse, of many authors: thoughtlessly killing off the other gender. Gender and fairness are in the air this month. At my company's offsite of "directors and above," women were clearly only 10%-20% of those attending. And our leaders weren't happy about it, though honestly everyone seems a bit stymied about how to fix it: outreach in the schools to promote STEM (or STEAM--someone said the arts shouldn't be separated from science, technology, and math), work harder to recruit those women who are already in tech, work harder to promote those women in the company who aren't yet acknowledged leaders, or...? And I have dark and dour days when I feel like women judge women as harshly as men. Remember way back in the early 1980s when everyone thought that women joining the workforce would improve the workplace because we'd bring all our warm, nurturing, consensus-building skills? Not so much. Women tend to judge the exact same assertive behavior as negative in a woman, positive in a man, just like men. No matter what you think of Lean In, it's got a boatload of painful data about this. We've a long row to hoe, as Dad used to say. But like our company leader, like Laura Lippman, like the nice guys who don't want to finish last nor turn into a sociopath to succeed, I'm not sure what to do. I'll try harder not to respond to assertive women as if they're "too bossy." I'll rip the softeners out of my speech, even though it means risking getting labeled "too pushy." I'll support the ambitions of my friends and family, and most importantly, I'll make sure that my fiction doesn't shy away from the hard question of how we make the world a better place for our daughters than it is for us. 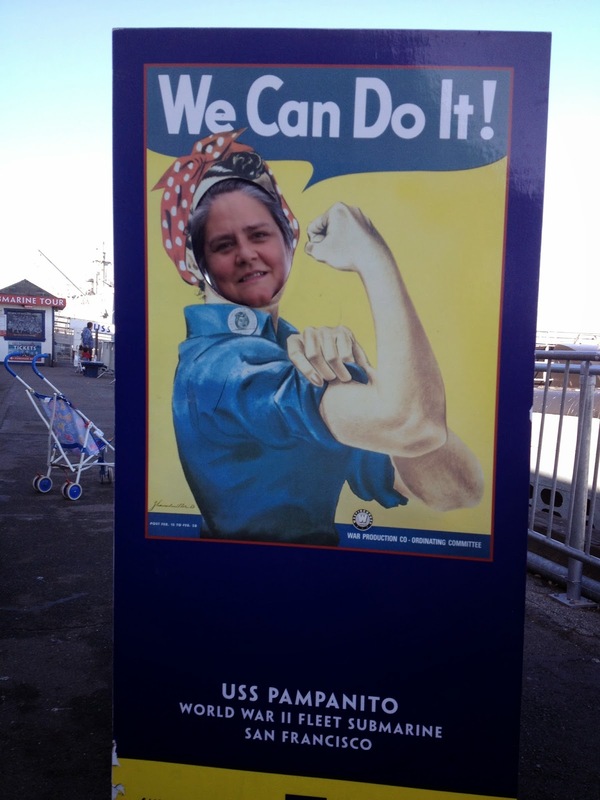 I guess it's about time we all go a little Rosie the Riveter. If you've got any ideas, please send them my way. I've only got another decade or two on this planet. It seems like just being strong and "bossy" isn't enough. P.S. My husband wasn't being mean or derisive when he said "Of course." He knows I'm writing a noirish story with an homme fatale, and sincerely expected all the tables to be turned in my book. His faith in me is amazing. 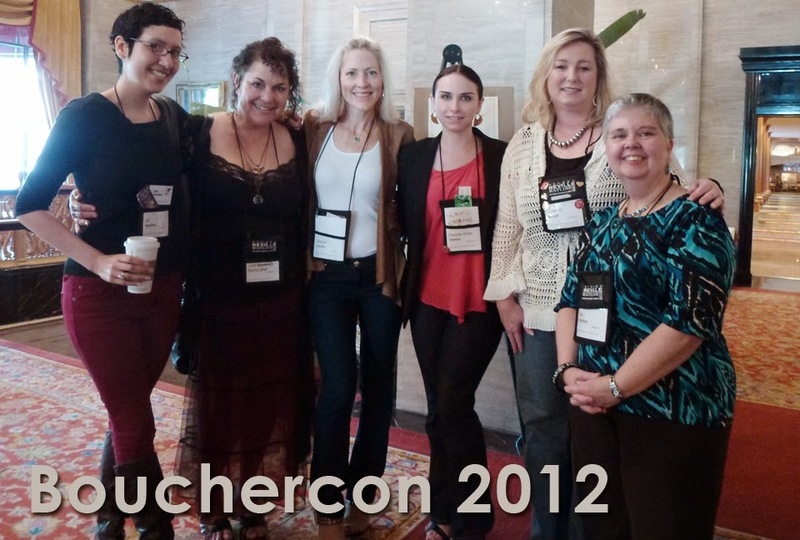 Named for mystery author and editor Anthony Boucher, Bouchercon is the big convention for fans of mystery fiction. It takes place each autumn, and the location bounces around the world. Mystery readers and writers gather to talk mystery, meet their favorite authors, discover new books, and generally have a good time. 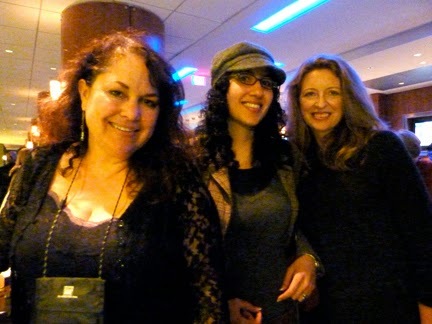 at Bouchercon 2009 in Indianapolis. 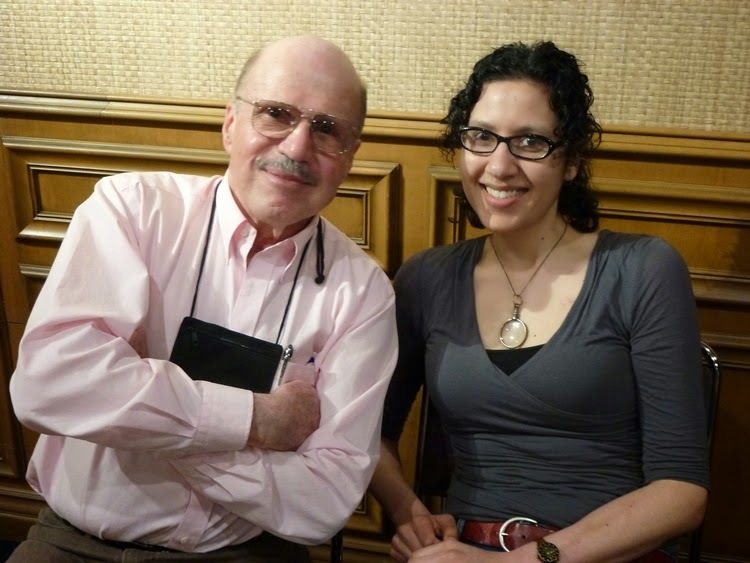 I attended my first Bouchercon five years ago, in 2009. I was taking my writing more seriously, but I wasn't yet published. 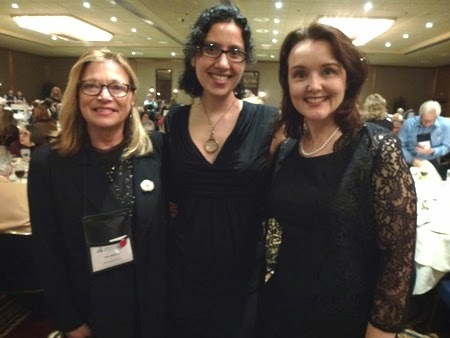 Two author pals suggested I attend Bouchercon with them. 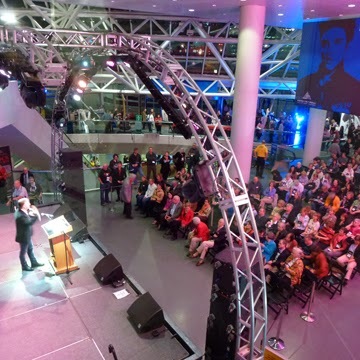 I admit it sounded a bit daunting, because I knew only a handful people in the mystery community, and there were going to be over 1,000 people attending. But I figured as a huge fan of mysteries, I owed it to myself to check it out. It turned out I had such a great time that I've been back multiple times, and can't wait for this year's convention! Murder at the Beach takes place in Long Beach, CA, from November 13-16, 2014. 1. 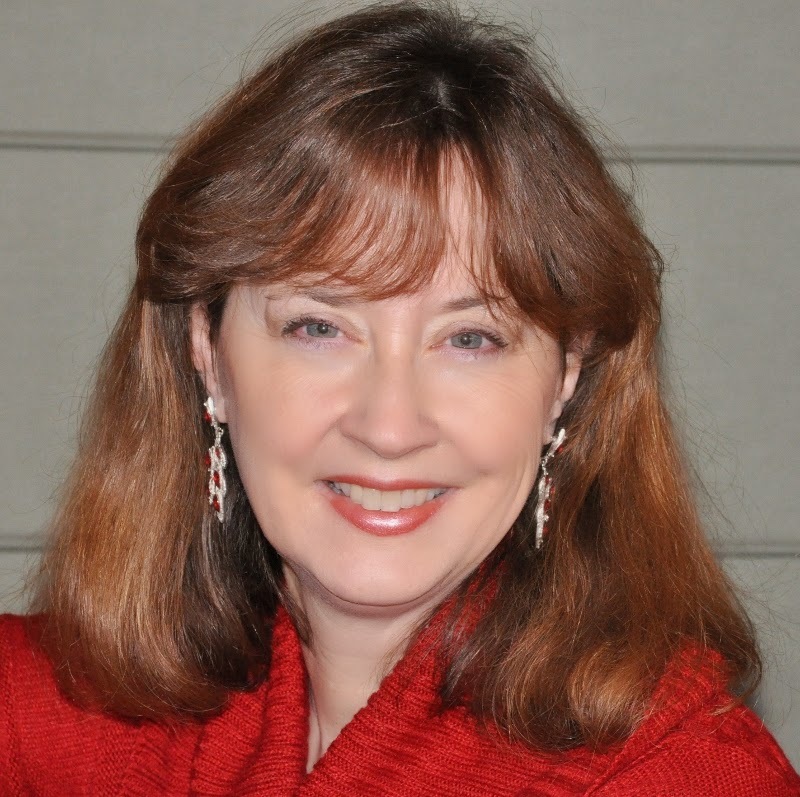 Realize that many mystery writers and readers are introverts, so you're not alone! The vast majority of us are pushing ourselves out of our comfort zones when we attend big conventions. But everyone I've met over the years has been friendly, so with only a small amount of effort, you'll find yourself with new friends in no time. 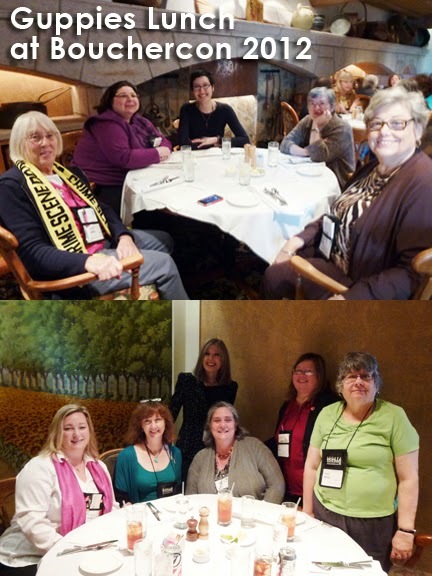 In the photo directly below, taken at Boucheron 2012 in Cleveland, I hadn't met half the lovely women in the photograph before that weekend, but by the time I flew home, I thought of them as friends. 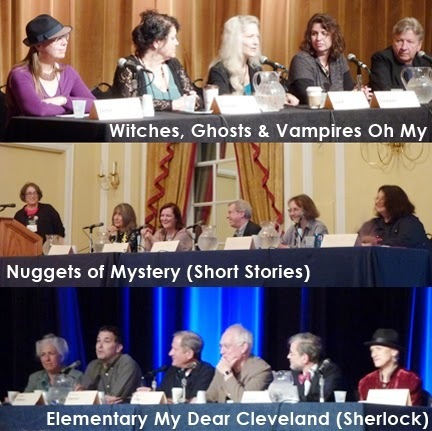 Bouchercon is a lot bigger than mystery conventions like Malice Domestic (celebrating traditional mysteries) and Left Coast Crime (the West Coast's mystery con), meaning there's so much to see and do -- but also that it's even more important to take a break. Mysti Berry, Gigi Pandian, Sophie Littlefield. Meeting online friends in person. 3. As soon as you arrive, look through the program book and circle the events you want to be sure to attend. That way you can be sure to get in the good stuff you want to see, such as a panel on a topic that interests you or an interview with one of your favorite authors. Trust me. If you don't write it down on paper or put it in your phone calendar, you'll miss things you meant to see. I've done this multiple times, so I need to follow my own advice! 4. Once you've figured out everything you absolutely must attend, be open to new experiences. 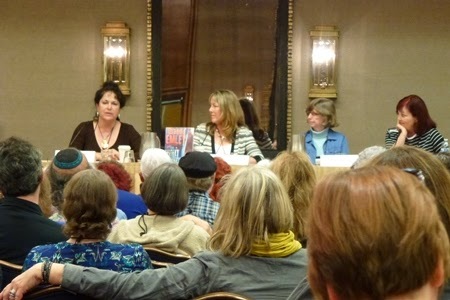 One of the reasons I had such a good time at my first Bouchercon was because I had no expectations. I didn't have a book out to promote, so I was attending to see what the convention was all about. I loved picking up bookmarks from new authors, having hallway conversations with people as passionate about mysteries as I was, and meeting interesting people at the bar. 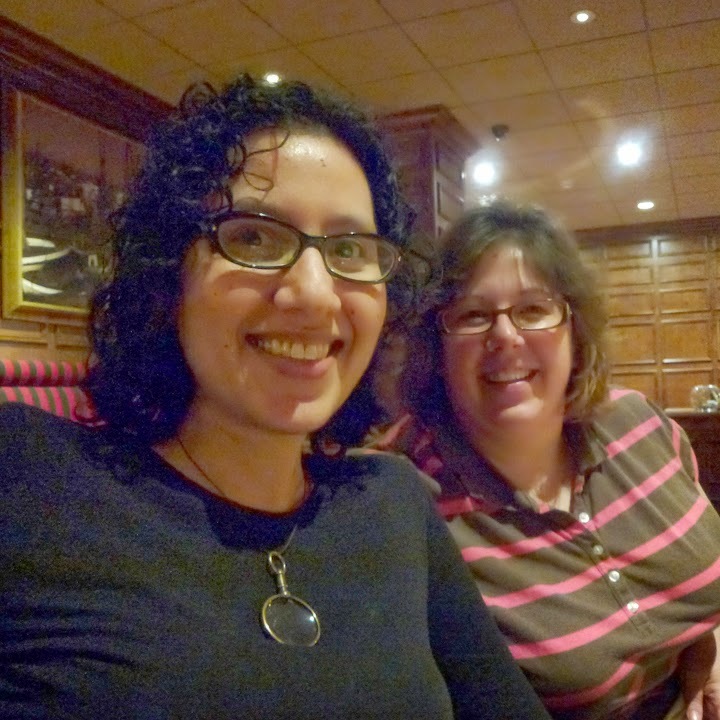 None of those things were formal parts of the program, yet they were core parts of the Bouchercon experience. at the Rock and Roll Hall of Fame. 5. Don't forget to look over the attendee list. The long weekend will be over before you know it, and you want to be sure to connect with people you might not have another opportunity to see. 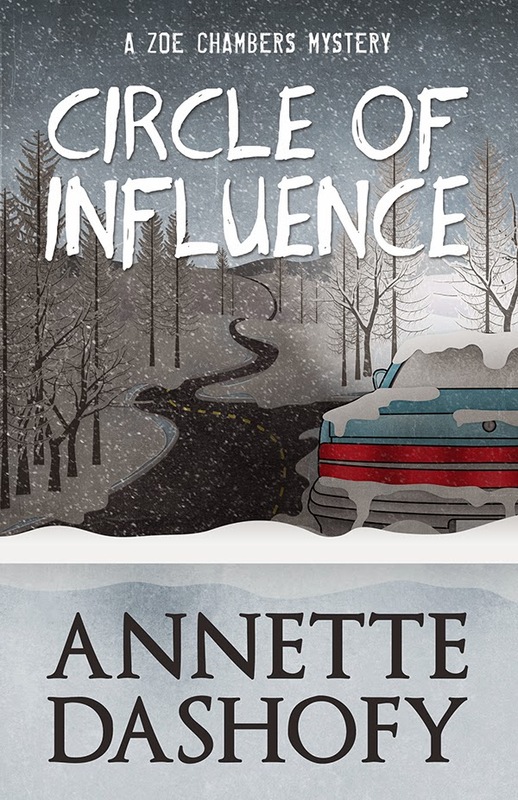 Be it saying hello to a favorite author at their signing, or meeting up with a friend you know through an online mystery discussion group, making a checklist of names in advance is helpful. I hope to see you at this year's convention! Sorry I've been absent for a few months. I've been writing up a storm and finally have some news to share!! 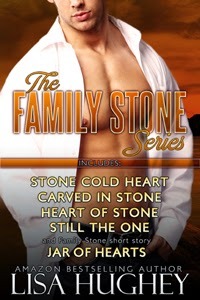 The box set of the Family Stone novellas is out now! It's available at Amazon, BN, Kobo, and AllRomance and will soon be on Apple iBooks (pretty darn excited about that!) for $5.99 and includes the first five books in the Family Stone series. Stone Cold Heart, Carved in Stone, Heart of Stone, Still the One, and Jar of Hearts. More fun news: All the Family Stone books will soon be available on iBooks! And finally supporting causes...I have a donation in the Brenda Novak For The Cure auction to raise money for Diabetes research. Hope you are enjoying Spring...Happy Reading!! Validation has been on my mind a lot lately, as I rush to finish some projects in order to pitch them to agents, editors, and writers I dream about working with. It all started with some observations made by various writer friends over the years. Every now and then, usually when the liquor was mostly drunk and the evening reached with ragged sleeves toward dawn, someone complained about how darn much self-esteem writer X had. How did X have bullet-proof confidence in all defiance of every objective measure of his talent? Those pre-dawn venting sessions stuck with me. It’s always frustrating to us humble folk, who dash from gatekeeper to gatekeeper, hoarding the smallest compliment in our camel’s hump of self-esteem, to run into a lucky bum with a lousy book. How dare he be so proud of a limited vocabulary, of familiar tropes, of stereotypical characters? How dare he? Well, actually, it was usually doing him a lot of good. When was the last time you bought something from a diffident salesperson? Then one day I met a motivational speaker, who said she’d noticed that in her seminars, men most often looked to themselves for validation, and women looked most often to external sources for validation. She went on to say that there’s two components to any skill: competence and confidence. Far too often, she said, women throw all their energy into acquiring competence and yet still feel that unless someone else says so, their competence isn’t valid—regardless of how skilled they might actually be. “Imposter syndrome” is another term for it. I thought of those loud and preening gents who sold their first novel well before I did, who got contracts for books with plots as thin as onion skin. Is there any way to be more like those fellows and less like me in the confidence department? Can I simply decide to look to myself for validation? How can I harness my inner Helen Mirren? 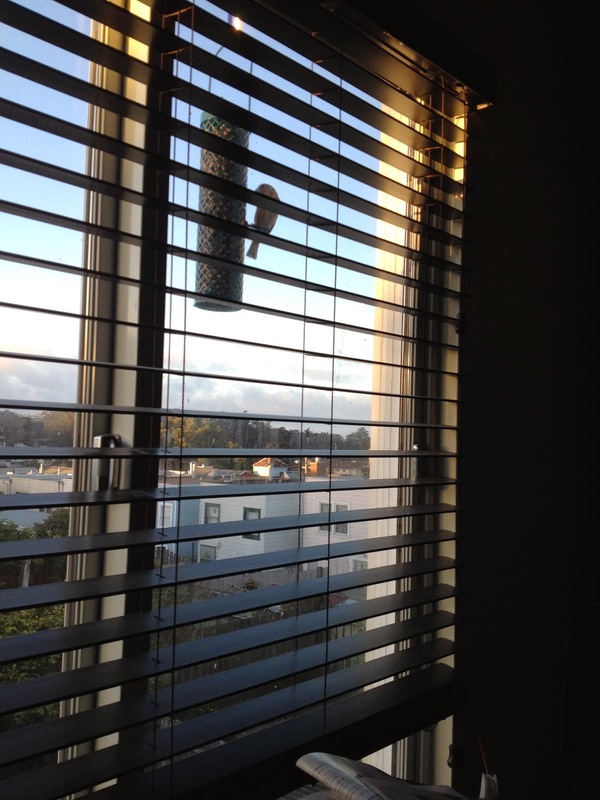 · Every time I notice myself thinking “they won’t want to talk to me,” I imagine the roles are opposite. I almost always want to listen to someone pitch me an interesting idea or tell me about an interesting book. · Every time I feel that desperate scream for validation escaping, I think about a time my words moved someone. The screenplay scene that gave a classmate nightmares, or the lovely passage a published writer called out when reading my work, or that one day when I found a paragraph so perfect that I thought someone else must surely have written it. This is real, I tell myself. That feeling that someone else must say I’m good is not real. 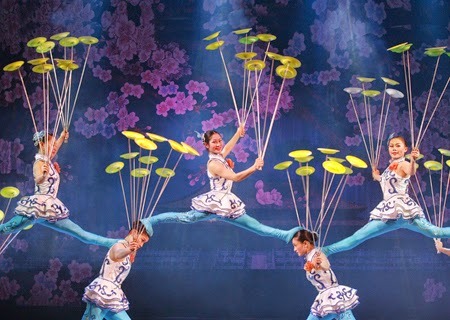 · I think about my women friends, incredibly talented, doubting themselves. Letting someone else tell them what to write, or how to write. Believing all the negative comments and none of the good ones. Of course they are mistaken—so likely so am I.
It’s okay to be wrong—I don’t have to be the first person to know I’ve made a mistake. It won’t kill me to fail in public. Not experimenting enough to fail and learn, now, that will cut me off from my creativity and leave me cowering in the corner, afraid to write the wrong word. Let our confidence be reborn and become the strong twin to our competence. Please comment and tell me how you've learned to look to yourself for validation!